Today I have had the most Christmassy and wonderful day ever. 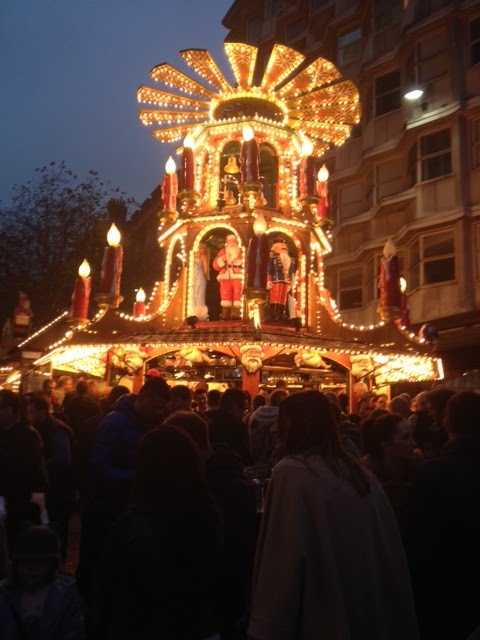 Me and my flatmate hopped on the train to Birmingham, which is not far from our uni at all, to spend the day shopping in the Bullring and browsing the German Christmas Market and the Craft Market. We decided to eat at the Handmade Burger Co. for a late lunch, because it is somewhere we have both wanted to try in ages, and neither of us have one where we live at home, or near us at uni. It is an AMAZING Burger Joint, the meat is such great quality and the burger wasn't greasy at all. 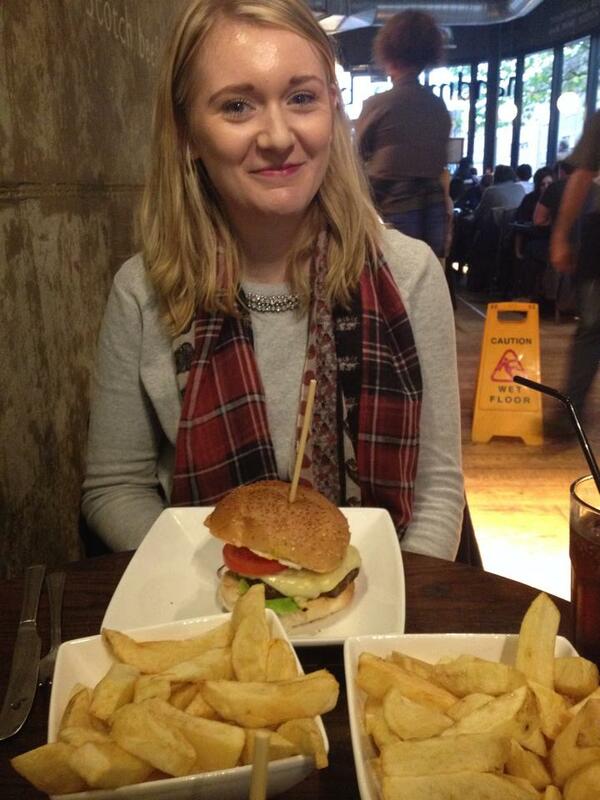 The chips were seriously chunky and were very similar to chip shop chips, they were so yum! 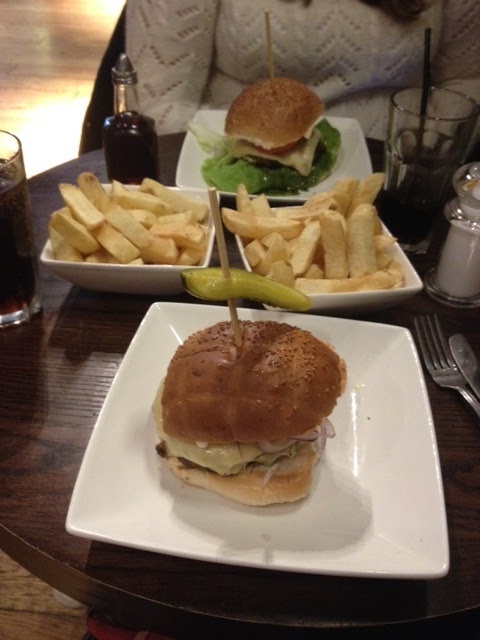 We both ordered the American Cheese, which was 100% Prime Scottish Beef burger, with Cheese, Onion Rings, Gherkin, Lettuce, Tomato and Red Onion, with a side of chips. We both had bottomless cokes as well, and it came to roughly £14 each which we thought was extremely reasonable for the quality of the food. We were so stuffed we couldn't manage a dessert, although the Banoffee Pie Sharing Sundae looked amazing. The market was as lovely as always - we had been before in our first year of uni. There are lights everywhere, and the stalls are within these little Christmas Cabin type buildings. There are German Stalls selling every kind of food imaginable - from pancakes and crepes with Nutella or Kinder, to marshmallows covered in chocolate - and no word of a lie, the marshmallows were so big one would barely fit in an adult hand! Hand decorated chocolates, coffee beans to eat in every single flavour from caramel to vanilla to blueberry muffin! And best of all, the most amazing doughnuts ever! My flatmate and I purchased a Jam doughnut covered in Icing Sugar for our supper (the healthy eating WILL start again tomorrow). 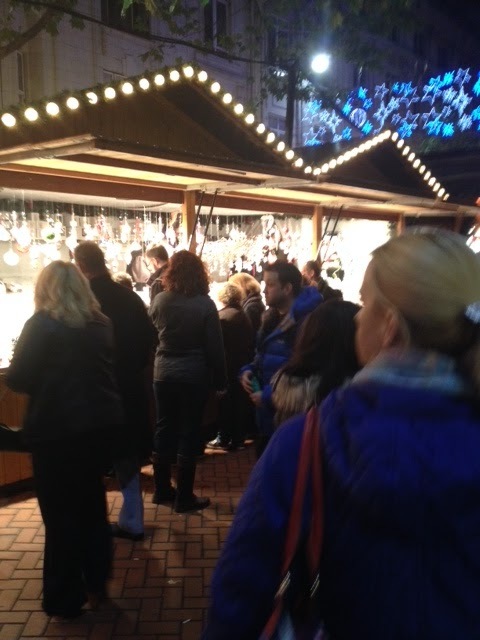 There were hot chocolate stands, winter Pimms, mulled wine, and huge tankards of German beers being carried around by visitors. There were lots of Christmas decorations on sale which were absolutely beautiful and unique, and lots of fairy lights and general homeware. There were several stalls selling precious stones which was really nice but I was good and resisted most of the things! I purchased myself a Christmas tealight holder which is stunning. I've really developed an obsession with candles recently. I would upload a photo, but it's all tissue papered up! 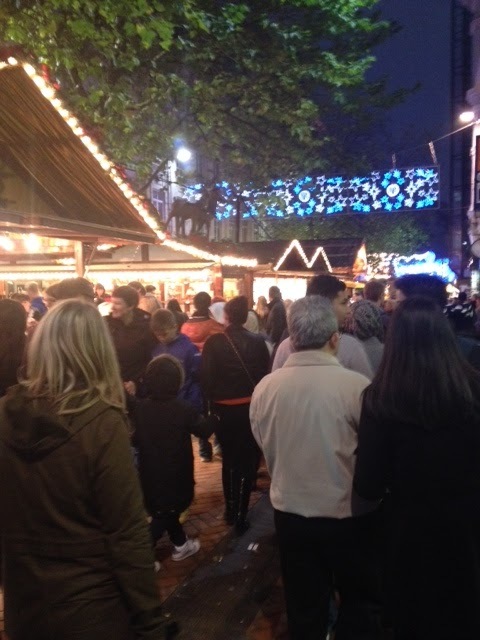 I've never seen anything like it, and honestly - if you are into unique little treasures and live near Birmingham, the German Christmas market is definitely for you! 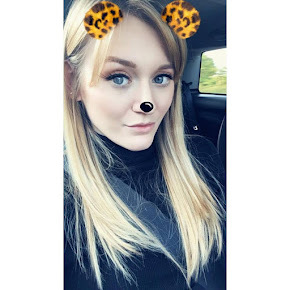 The Bullring is great to shop in - Selfridges, New Look, River Island, H&M and the Disney Store had so many things in I could have purchased, but I was so good! At this point we were exhausted and fairly cold, so trudged off to the train station with hot chocolates each.